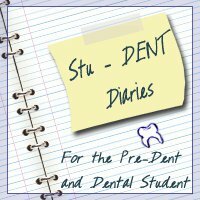 Stu-DENT Diaries: I've been featured! I'm so happy to be featured in OnlineColleges.com's Top 50 Blogs for College Students. I'm happy I can be a great resource for those looking for information on pursuing a career in health care, particularly dentistry, and I'm happy I can give a glimpse into the life of a dental student. Here's the top 50 list. Find me under Education. There are so many other cool blogs out there too! You should be proud. Thats not an easy acheivement. Goes to show you have good content. I would love to think so. Thank you.